Valentine's Day is right around the corner. As a hopeless romantic it is a little odd but I think Valentine's Day is kind of cheesy. While it may not be one of my favorite holidays I do love dressing in the appropriate colors of pink and red for the day. Each item included above is under $50 and very beautiful. 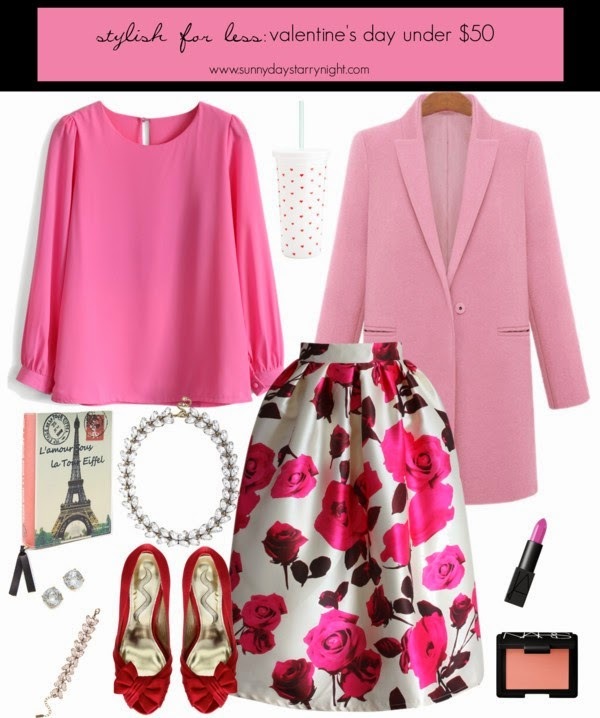 I love this romantic rose print skirt, feminine chiffon top and bow adorned heels. I have mentioned on here before that one of the best purchases I have ever made is a pink coat. It always receives compliments and just makes me happy to wear. This pink coat is a great bargain at only $39. Do you have any special plans for Valentine's Day? What will you be wearing? Pretty finds! I love all the pink. oooh! that skirt and that coat! I don't really do anything special on Valentine's day, but I'd love to get these lovelies in my closet!